Coming out of college, I had a lot of dreams in life. I had traveled significantly and done volunteer work in orphanages and schools in Central and South America. After graduation, I wanted to do international development nonprofit work. I thought it would be a remarkable life of adventure where I would make a difference in the world, and therefore, it wouldn’t feel like a job. Like many people pursuing FIRE, I wanted to work, but I didn’t want it to feel like a job. After graduation, Corey and I went to Nicaragua to teach English at an indigenous university. We thought we were going to love it. We thought it wouldn’t feel like work and that it would allow us to live a life of adventure. It’s very possible that these things might have been true. However, we both ended up getting very sick and needing to return to the United States for treatment and recovery. I knew I wanted to do mission-driven work. I naively believed that working for a nonprofit wouldn’t feel like a job because I’d be working toward a mission I believed in. Some people pursuing FIRE say that want to retire early from the corporate sector so that they work another job, maybe in nonprofit, that they’d enjoy more. These same people often also communicate that they want to get out of the corporate rat race of meetings, profit margins, long commutes, and regular work hours. As someone who has worked in nonprofit for my entire career, these two statements seem contradictory. Either people believe that working for a cause will make these undesirable things worth it, or they don’t have a picture of what working in a nonprofit would look like. I don’t dispute that someone could enjoy a job in nonprofit more. I certainly do. At the same time, I wouldn’t call it early retirement. Nonprofits have many of the same challenges as corporate America, and in general, I don’t believe that working in a nonprofit feels like early retirement. Even though I’m working part-time in a nonprofit, it feels like a job. Just because someone works in a nonprofit organization doesn’t mean that they escape aspects of the rat race that many early retirement dreamers are motivated to leave behind. While I believe that working toward a cause can make some of these things more bearable, these challenges are still pervasive. Many people pursuing FIRE say they want to work on their own terms and have a high level of flexibility in their lives, so they can spend time with family, do things that are important to them, and travel the world. Similar to corporate America, nonprofits typically have standard 9-to-5 business hours. While some nonprofits provide a level of flexibility to work from home or shift hours earlier or later, sometimes this isn’t possible. Similar to service-oriented roles in the private sector, many nonprofits have clients they serve during regular business hours. Vacation time is also limited. In all the time I’ve worked in nonprofit, I’ve always had somewhere between 3-to-4 weeks of vacation, which is fairly standard across the sector. Similar to the private sector, people who work in nonprofits also have commutes that extend their day. In my last role, my commute was 45-55 minutes each way. Luckily, my current role requires only a 25-30 minute commute. Sometimes the commutes are even longer for people who work in nonprofits. Why? Many nonprofit organizations work with people who have lower incomes and are often situated in areas where people will have easier access to their services. Because low-income communities often have less access to good public transportation options, nonprofit employees also often have longer commutes because of this. I have a friend who works for a nonprofit and her office is located in a neighborhood school here in Boston. This neighborhood does not have access to good public transportation. To get to work, she must take both a train and a bus. Her commute is 60-75 minutes each way. Another friend must either take a local train and a commuter train and then walk 15 minutes, or she could take two trains and a bus. Her commute is about 75 minutes each way. People often think nonprofit is a magical place where everyone is nice, caring, and hardworking. While I would say most people are, there are those who lack self-awareness and empathy just as in any workplace. I’ve certainly experienced my fair share of politics and drama in my nonprofit career. I’ve had some great bosses, and I’ve had terrible bosses. I’ve had bosses who yelled at me when I didn’t achieve my goals and consistently undermined my work. I even once had a boss who was eventually terminated because he didn’t accomplish anything. These are the most extreme of circumstances. I would expect, just as in the private sector, that these situations are few and far between. While I do believe that most people I’ve worked with are very well-intentioned, it doesn’t mean they do everything perfectly. They still struggle to communicate effectively, manage projects efficiently and to completion, and be strong leaders. Even though a nonprofits’ main goals are focused around their mission, nonprofit organizations still need their revenue to outpace their expenses (i.e. be profitable). Most nonprofits raise their revenue from foundations, corporations, individual donors, or government grants rather than selling goods or providing services. If an organization doesn’t mean it’s revenue goals, it doesn’t only mean that workers won’t get paid or might get laid off, it also means that the impacts will be felt by the communities we serve. Because nonprofit goals are often tied to urgent societal challenges, nonprofit professionals deeply understand the ramifications of not meeting their goals. There’s a kid that might not get to participate in an after-school program. There might be a family forced to choose between dinner on the table or heat in the winter. There might be a family that needs to completely deplete their assets due to a major health issue. This understanding which causes people to be so passionate about their work can also produce overwork and burnout. Nonprofits do not always have the resources or personnel to meet their goals in a sustainable way. There is a consistent pressure to do more with less. 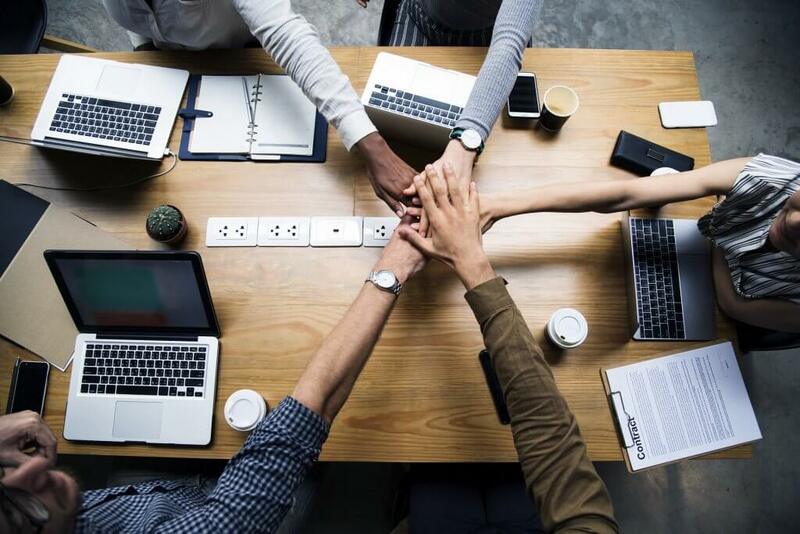 Because many funders only want to fund programs and not infrastructure, there is pressure on organizations to keep their administrative (Finance, HR, Technology, Fundraising) functions very lean while at the same time scaling their programs. Sidenote: Over the past several years there have been significant contributions to the discussion of Nonprofits’ overhead, most notably by Dan Pallotta at Charity Defense Council. If you want to learn more about how to influence change in our world or challenge your understanding of how to evaluate a nonprofit organization beyond the traditional question of “How much of every dollar goes to the mission?” I recommend you spend some time reviewing their work or even watching Dan Pallotta’s Ted Talk. People in nonprofits often have a high volume or work and wear many different hats. In a previous role, I consistently worked 50-hour weeks and felt like I was moving at a frantic pace to get everything done that I needed to. These impacts extend beyond capacity and responsibilities to other aspects of the organization as well, such as technology, supplies, and professional development. In nonprofits, with the pressure to keep costs low, my experience is that nonprofits regularly aren’t able to access or purchase technology that would make our work better and more efficient. While not always the case, we often do what we can with free or low-cost resources. In a previous job, the person who ordered supplies left. They never replaced her. In an effort to cut costs, they also never assigned the responsibility of ordering supplies to anyone else. If we needed pens or notebooks, we could buy them ourselves and reimburse them. That was also the job where there was a Keurig machine, but in order to have coffee, you needed to bring your own K-cups and cream if you wanted to use it. At some nonprofits, there is also not enough time or money to make professional development a focus. The nonprofit may be lean and not have the capacity within HR or management functions to focus on this. While some nonprofits make this a priority, some can’t. This pressure to do more with less can lead to burnout, turnover, and a belief in a lack of career options within the organization. 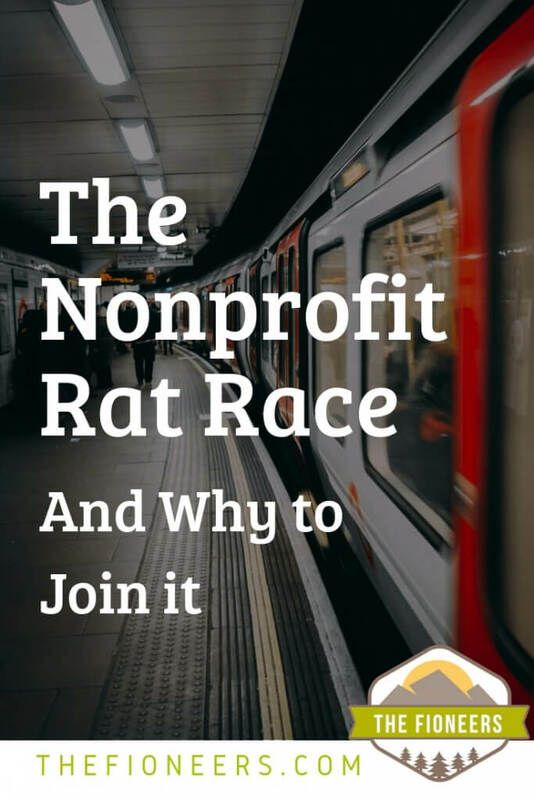 Here’s the irony of understanding that nonprofit employees can also get caught up in the rat race: When you understand that working for a nonprofit is not an escape from that reality, you can start to consider working for a nonprofit now. Most people see the pursuit of FIRE as a two-phase journey, where you work hard now and accumulate your assets and then you enjoy life and have meaning later. As Fioneers, we believe that the journey to FI should be just as remarkable as the destination. To us, FIRE is not a two-phase journey. It is a many phase journey where we are making changes to our life along the way so that our lives continue to better align with our goals of having meaning, purpose, happiness, and adventure in our lives now and in the future. In fact, because of this belief, I recently took a part-time job in a nonprofit organization. This nonprofit has a mission I am very passionate about, and I’m excited about the ability to focus more time on my writing outside of work. While this decision might slow down our timeline to reach FI, it’s okay because it brings us a step closer to the life we want to have both now and in the future. Because this step allows us to have more meaning, purpose, balance, and happiness now, it’s okay if it takes us a bit longer to reach FI. We believe that you should focus on the journey as much as the destination. Do you have a dream of spending your time focused on a cause you believe in? If so, I don’t believe you need to put it off until after you reach FI. I’d encourage you to consider whether working at a nonprofit is an option now during your journey. While it may slow down your timeline slightly, it may be worth it on your journey. While we make less money than our private sector counterparts, we certainly make living wages. In 2018, we were able to achieve about a 60% savings rate, and we do not feel deprived in the slightest. Our path has provided us with financial security and freedom to live a life of meaning and purpose now. That matters more to us than anything else. I chaired a nonprofit organization as a nonpaid volunteer and shortly after I early retired the CEO of my nonprofit also retired. She was making almost as much as I had made in my engineering job prior to retirement and the board prodded me about coming out of retirement to become the organization’s CEO. This foundation did not have to raise money, it operated strictly off the growth of a pretty huge endowment. It was an ideal job as far as nonprofits go, but I had already decided to only work for entertainment as an engineeering consultant about one day a week rather than go back to a full time job. I get the same satisfaction of helping others as a nonpaid volunteer and get to keep my time. And I can second that having over one hundred employees there is always plenty of drama even in a charitable nonprofit. There is also the constant pressure to spend as little as possible on anything that doesn’t directly minister to the needs of those we serve. Business is like that too, but when every dollar you spend could have gone to feed or provide medical care to a person in serious need of help, it is a different kind of pressure. Thanks for your comment! That is great that you had the opportunity to volunteer on the board for a nonprofit. I can completely understand why you didn’t want to come out of retirement to be the CEO of a nonprofit! Working full time (even for a nonprofit) would be a huge commitment in retirement, and it sounds like the volunteering is providing you with both the satisfaction and balance you desire. Thanks again for sharing your perspective! This is a great piece! Work is still work–so true. To make higher salaries in nonprofits, you have to tolerate more of the negative aspects of work because you move further away from direct delivery of service to clients. However, it’s been helpful to me to recognize how powerful excellent leadership can be for the quality of the experience of workers in direct contact with clients more frequently. Obviously, I prefer nonprofit work, though. Both my regular job (education) and my “side hustle” (crisis support) are with nonprofits. It’s easier to tolerate the downsides of work when you support the mission of your workplace. Thanks for your comment. I completely agree; with strong leadership, the important work at nonprofits can be done much more efficiently and everything is more enjoyable. I’ve always worked back office functions in nonprofit organizations, so have not done much direct service delivery, and I think you are right, back-office functions generally get paid more in nonprofits, but not always. I’ve previously worked for an org where the folks doing the service delivery were paid much higher than the ops folks. I’m excited to meet more nonprofit folks interest in personal finance. This definitely mirrors my own experience in non-profit work. I would say that it is critical to find the right non-profit to work for. Good leadership can make for a positive experience, while poor leadership can mean that you are often taking the paycut of working in the non-profit sector while experiencing all the worst tendencies of for-profit work culture. I completely agree. Great leadership really makes or breaks it. Sometimes nonprofits can be the worst cultures to work in, especially if the perspective of leadership is that people should be grateful they can work for a cause and not focused on creating a positive culture or focused on employee development or growth. Have you had positive experiences in nonprofit? Or mostly negative? Thank for calling this out! After serving in the Peace Corps, I went into the corporate world, because I just know I’m not the kind of person where a “good cause” is worth the grind. If I gotta grind, I wanna get paid well. Now that I’m out of the corporate world, I’m slight afraid to get back into the social impact space. Perhaps I need more time to get over the trauma of endless meetings and never-ending emails. I can imagine being burned out after the Peace Corps also! In the social impact space, I do think it really depends on the organization how things will be, but maybe going back into a traditional work environment isn’t for you. Maybe entrepreneurship or something else would be more up your alley?